How to Test Dissolved Oxygen (DO)? How to test Oxidation-Reduction Potential (ORP)? 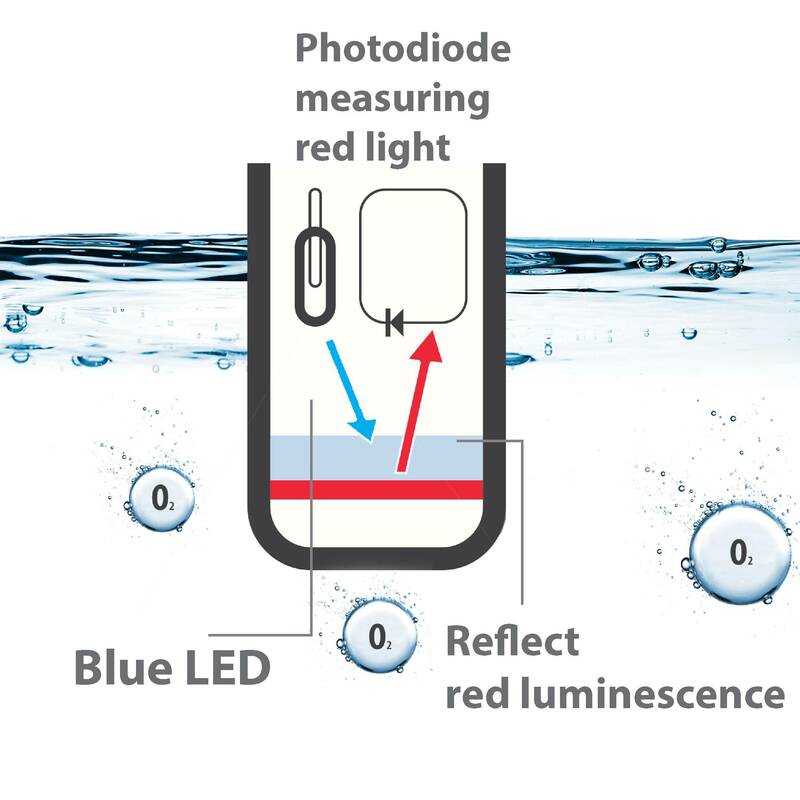 Oxidation-Reduction Potential (ORP) is measured by inserting an ORP sensor into water. This can be either a handheld sensor or it can be built into a system. The meter then reads the electrical potential (voltage) from the sensor, and it may apply a correction or offset before reporting the value. The reported values, which can be positive or negative, are usually reported in millivolts (mV). ORP sensors work by measuring the electrical potential (voltage) between two electrodes in contact with water. Both electrodes are often contained in a single unit called a combination electrode. One electrode is called the indicator electrode, and it is usually made of platinum (other materials such as gold or graphite are also sometimes used). The other electrode is called the reference electrode. The reference electrode is usually made of silver and silver chloride (Ag/AgCl electrodes), although electrodes made of mercury and mercury chloride (called “calomel electrodes”) are sometimes used. This electrode contains a filling solution containing potassium chloride. Electrons from the water interact with both electrodes, creating a voltage between them that is read by the meter. The voltage created between the two electrodes actually depends on the type of reference electrode. For example, for the same water, a higher voltage will be read when using a Ag/AgCl electrode than when using a calomel electrode. Because of this, it is sometimes useful to report an ORP reading that has been adjusted to correspond to a standard reference electrode called the Standard Hydrogen Electrode (SHE). SHE ORP values are comparable to a quantity called Eh, which describes the theoretical ORP of the solution and has the same scale as SHE ORP measurements. The SHE requires bubbling hydrogen gas through a strong acid solution, so it is not practical for routine laboratory or field use. This reference electrode produces a voltage that is about 200 mV higher than what is produced using the Ag/AgCl electrode. When converting a Ag/AgCl ORP value to SHE, +200 mV is added to the Ag/AgCl ORP number. Technical note: The actual mV value added when reporting an ORP value in reference to the SHE may depend on the concentration of the filling solution. Because the meter reads the ORP voltage directly from the sensor, a calibration is not necessarily required. However, because the response of the sensor can degrade over time, it is sometimes desirable to test the sensor using a standard solution to verify that it is giving the correct response, such as within +/-10 mV. Two common ORP standard solutions are Zobell’s solution and Light’s solution. At 25°C, Zobell’s solution has an ORP of approximately +228 mV when measured using a Ag/AgCl reference electrode, and Light’s solution has an ORP of approximately +475 mV under the same conditions. Technical note: The actual ORP values of Zobell’s and Light’s solutions depend on temperature and the concentration of the filling solution[1,2]. The testing with the standard solution can also be used to adjust the actual measured reading so that it matches the value of the standard. This is accomplished by adding an offset to the actual measured mV reading (the offset is the difference between the ideal mV reading and actual mV reading for the standard). This can be thought of as a type of calibration, and most meters can be set up to add the offset automatically. An offset can also be applied in other situations. For example, a user may want the ORP sensor to read a certain mV value when certain chemical conditions are reached, such as a specific combination of pH and chlorine concentration in a water disinfection application. This technique may be used to make ORP readings consistent between different ORP sensors, or a new offset may be calculated when an old electrode is replaced with a new one. ORP measurements are most often reported in mV values relative to the reference electrode used. Most often, the Ag/AgCl reference electrode is used, so values are usually reported based on measurements with this electrode. Calomel electrodes are less common because they contain mercury, so calomel ORP values are relatively uncommon. Sometimes, however, values are reported relative to the SHE. As explained above, these values are approximately 200 mV higher than values for the Ag/AgCl electrode. When ORP values are reported, the reference electrode that the values are based on should also be reported in order to avoid confusion. If values are seen where the reference electrode is not specified, they are usually assumed to be reported relative to the Ag/AgCl electrode. ORP is a common, simple and straightforward measurement that provides a quick indication of how oxidizing or reducing a water is. The reading provided by the meter depends on the condition of the sensor, any offset value provided during calibration, and the type of reference electrode used, so care must be taken in interpreting the results. Nonetheless, ORP is especially useful for providing either a quick snapshot of the oxidation/reduction state of a solution or for monitoring its changes over time. American Public Health Association (APHA) (2005) Standard methods for examination of water and wastewater, 21st edn. APHA, AWWA, WPCF, Washington. U.S. Environmental Protection Agency (2017) Field measurement of oxidation reduction potential (ORP). SESDPROC-113-R2. 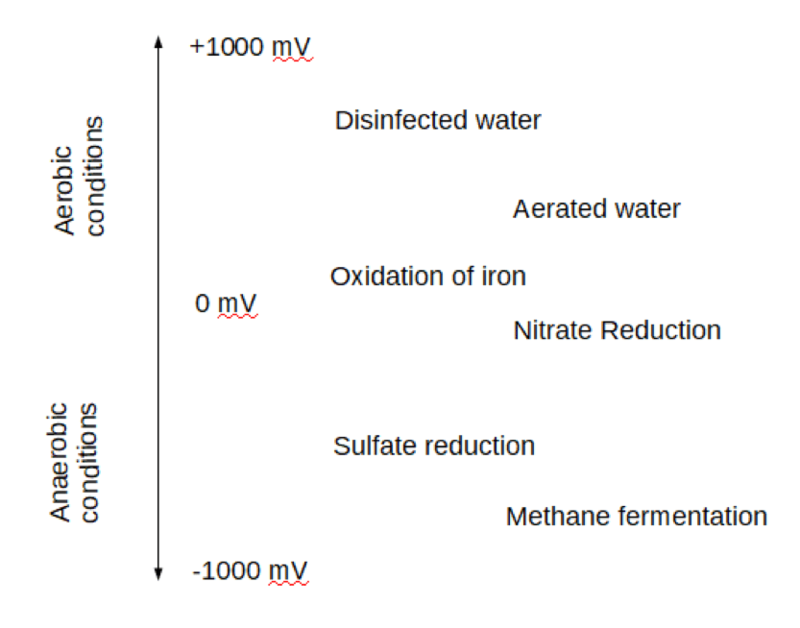 What is Oxidation-Reduction Potential (ORP)? Oxidation-reduction potential (ORP) or redox is a measurement that indicates how oxidizing or reducing a liquid is. For example, water may be moderately oxidizing (such as aerated water), strongly oxidizing (such as chlorinated water or hydrogen peroxide solution), or reducing (such as an environment where anaerobic microbes are active). In short, ORP is a measure of the cleanliness of the water and its ability to break down contaminants. This measurement has a variety of applications, such as checking for safe sanitation of drinking water or monitoring fluid for the suitability for anaerobic microbial processes. Oxidation and reduction are related chemical processes that refer to the exchange of electrons in a reaction. Oxidation refers to when a chemical loses electrons. Reduction refers to when a chemical gains electrons, so reduction is the opposite of oxidation. Both oxidation and reduction can happen in the same reaction, which is why reactions involving oxidation and reduction are often called redox reactions. In the above reaction, the oxygen atom was reduced because it gained electrons. In this reaction, the hydrogen atoms were oxidized because they each lost an electron. The oxygen atom gains electrons. The oxygen atom is reduced. The hydrogen atom loses an electron. The hydrogen atom is oxidized. The oxygen atoms are reduced. The hydrogen atoms are oxidized. In the reaction of oxygen and hydrogen gas to form water, the oxygen accepts electrons from the hydrogen, so we can say that the hydrogen is oxidized by the oxygen. Likewise, we canalso say that the oxygen is reduced by the hydrogen. Some common oxidation processes include decomposition of organic matter and conversion of iron to rust (iron oxide). From the above discussion, one might guess where the word “oxidize” comes from. Oxygen gas is very good at accepting electrons from other atoms, and this is indeed the most common type of oxidation process that occurs in the environment. From this, we might also suppose that an environment that contains oxygen gas is an oxidizing environment. In such an environment, iron will turn to rust, and aerobic respiration can occur. One might also guess that a reducing environment is an environment without oxygen gas. Such an environment often includes dissolved gases that are products of anaerobic activity, such as methane, hydrogen sulfide, and hydrogen. Chemicals (such as oxygen) that accept electrons from other compounds are called oxidizing agents, and substances (such as methane or hydrogen) that give up electrons are called reducing agents. The degree to which a fluid is oxidizing or reducing (represented by ORP) depends on the presence and strength of various oxidizing and reducing agents. ORP can also be thought of as representing the availability of electrons. Because reducing agents give up electrons, a reducing environment is one where electrons are relatively available. In contrast, an oxidizing environment is one where electrons are relatively unavailable. ORP is expressed as an electrical potential (a voltage). Generally speaking, a reducing environment is indicated by a negative reading, and an oxidizing environment is indicated by a positive reading. The most common unit for expressing ORP is the millivolt (mV), and most meters can read values ranging from -1000 mV to +1000 mV. The more extreme the negative or positive value, the more reducing or oxidizing the fluid is. One of the biggest applications of ORP is in water disinfection. Municipal drinking water supplies, for example, use strong oxidizers such as chlorine to kill bacteria and other microbes and to prevent their growth in water supply lines. Higher ORP values are associated with higher concentrations of the disinfectant, so ORP is used to monitor and control disinfectant levels in water supplies. In swimming pools and spas, disinfectants are used to kill microbes that may transmit diseases. In outdoor swimming pools and cooling towers, disinfectants are also used to prevent the growth of algae. ORP is also used for monitoring and control of many oxidation-reduction reactions in industrial processes. For example, in automated industrial systems, ORP is often used to maintain a slight excess of oxidizing chemicals such as chlorine, hydrogen peroxide and ozone, or reducing chemicals such as sulfur dioxide and sodium sulfite. In wastewater treatment, ORP is used to determine the types of microbial processes that are occurring and to help operators manage the treatment system by promoting or preventing certain reactions. For example, ORP may be controlled in various parts of a system to digest organic matter, remove nitrate or phosphorus, and control odors. Because low values of ORP indicate anaerobic conditions, ORP can be used to detect anaerobic microbial activity in the environment, such as in the water column or in sediment. ORP can also be used to indicate soil saturation, which makes it useful for mapping wetlands. In other environmental applications, ORP measurements can be viewed as an extension of the dissolved oxygen (DO) scale. DO meters can cover the range of aerobic conditions, but they cannot indicate how reducing an anaerobic environment is. The ORP scale, on the other hand, covers a wide range of reducing conditions. Because of this, ORP can provide insight into the chemistry of anaerobic environments, such as the types of microbial processes in sediments or reactions involving pollutants in contaminated aquifers. ORP can also be used in conjunction with membrane DO sensors to identify conditions where the DO measurements may be faulty. Under anaerobic conditions, membrane-type DO sensors may give false readings if sulfides are present. If the ORP measurement indicates anaerobic conditions, then positive DO measurements taken from these types of sensors should be considered suspect. ORP is a fast and inexpensive measurement of the oxidizing and reducing conditions in an environment or system. This makes ORP measurement suitable for a wide range of industrial and environmental applications where oxidizing and reducing conditions vary. ORP is especially useful for routine or continuous monitoring situations where slower and more expensive chemical tests would not be as practical. There are a number of different methods that can be used to measure dissolved oxygen (DO) in water. First, there are wet chemical techniques, where a water sample is collected and then subject to a chemical reaction used to determine the DO level. Second, traditional membrane DO sensors are available, where a probe operating on electrochemical principles is inserted into the water to read the DO level. Finally, newer optical sensors are available that allow for fast, continuous measurement without many of the shortcomings of traditional membrane sensors. The most common wet chemical technique for DO measurement is titration by the Winkler method. In this technique, a sample is collected in a special bottle that allows the water to be contained without coming into contact with air. Chemical reagents are then added to the water, including a titrant that is added until a reaction involving oxygen is complete (indicated by a color change). The concentration of DO is proportional to the volume of titrant added, which allows for a quantitative determination of DO. This technique can be used with low-precision kits for field use or for high-precision analysis using laboratory equipment. This method has a number of limitations. First of all, sampling must be conducted very carefully. Not only must care be taken not to agitate the sample or expose it to gases, but special techniques or equipment may be needed for sampling water at depths where pressure is greater than at the surface, such as the use of Kemmerer water samplers at depths greater than 2 m.
Second, because biological activity consumes oxygen, there is only a limited time available between sampling and when the analysis must be completed. Samples containing appreciable amounts of biodegradable material must be tested immediately, and other samples may be stored for a few hours after preservatives are added to temporarily stop biological activity. With sensor techniques, a probe can be inserted directly into the water, so a sample does not necessarily need to be collected. Traditional DO sensors employ electrochemical cells separated from the water by membranes. There are two different types of these sensors: galvanic and polarographic, the difference being that a polarographic system requires that a voltage be applied to polarize the electrodes, and the galvanic system does not. In both types, the electrochemical cell contains two electrodes and a filling solution (containing potassium chloride or potassium hydroxide). This cell is separated from the water by a membrane that is highly permeable to oxygen but otherwise separates the water from the filling solution. As oxygen passes through the membrane, it interacts with the electrodes, causing a current to flow through the meter, which is used to determine the DO concentration. Polarographic sensors require that the electrodes become polarized before measurement can take place. This warm-up period can take several minutes. The reaction in the sensor consumes oxygen, so the signal detected by the meter depends on the transfer of oxygen across the membrane. Because of this, the method requires that the water be either flowing or stirred. One consequence of this is that the measurement may be affected by the flow rate of the water. These types of sensors also require occasional cleaning of the electrodes and replacement of the membrane and filling solution. The U.S. Environmental Protection Agency recommends that the membrane and filling solution be replaced prior to each study, which adds to the operating cost of these devices. This newer type of sensor operates on a very different set of principles than galvanic or polarographic probes. In this method, oxygen in the water interacts with a fluorescent material, which in turn affects how it interacts with certain wavelengths of light. Blue light from within the probe excites the fluorescence of the material, but this effect is quenched by the presence of oxygen. The higher the DO concentration, the smaller the amount of fluorescence that is seen by the detector. This type of sensor provides some important advantages over traditional membrane sensors. They require less maintenance as there is no membrane or filling solution to replace. Additionally, because the measurement does not consume oxygen, the measurement is not affected by the flow of water, and stirring is not necessary. Unlike polarographic sensors, optical sensors do not need to polarize, so the sensor is ready for measurement immediately. Both traditional membrane sensors and optical sensors can be calibrated using air as a source of oxygen. This can be accomplished because the concentration of oxygen in the atmosphere is a constant, known value (20.9%). A cap containing water-saturated air is often used for calibration. Alternatively, water saturated with air or standards with known DO concentrations (determined using the Winkler method) can be used for calibration[1,2]. The most precise measurements of DO are Winkler titrations conducted using laboratory equipment. However, this requires careful sample collection and preservation, as well as transportation to a laboratory within a short time frame. Field test kits using wet chemical techniques do not offer the same level of precision. Sensors, including traditional membrane sensors and newer optical sensors, are more convenient to use because the DO can be measured in place without sample collection, and they allow for continuous and even remote monitoring. Traditional sensors require replacement of membranes and filling solutions, stirring, and may require a warmup period before use (for polarographic sensors). Newer optical sensors are even more convenient because they do not have these limitations. U.S. Environmental Protection Agency (2017) Field Measurement of Dissolved Oxygen. SESD Operating Procedure SESDPROC-106-R4. Dissolved oxygen (DO) is oxygen gas (O2) that is dissolved in water. Gases in the atmosphere, such as oxygen, nitrogen and carbon dioxide, naturally dissolve in water to some degree. Like salt or sugar, these gases are invisible in water once they become dissolved. The element oxygen exists in many forms in nature. Although most people know that oxygen is part of the water molecule, most would be surprised to hear that oxygen is also the most abundant element in rocks. In these forms, oxygen is bound to other elements such as hydrogen, silicon or carbon. Molecular oxygen (O2), which is in air, is different than other forms because it is not bound to other elements. In nature, the O2 that we breathe is chemically much more reactive than the more abundant forms of oxygen that we come in contact with. This is what allows plants, animals and other organisms to use O2 to metabolize their food through the process of respiration. The amount (concentration) of O2 dissolved in water is most often expressed in terms of milligrams per liter of water (mg/L). This concentration is referred to as the dissolved oxygen (DO) content of the water. There is a natural tendency for water in contact with air to dissolve O2 until the saturation concentration is reached. For example, the DO in fresh water at 25°C in contact with air is 8.3 mg/L, assuming that equilibrium between water and air is reached and that nothing is removing the O2 from the water. DO concentrations are sometimes expressed as % of saturation. If the DO of the water is at the saturation concentration, then it is said to be 100% saturated. If the DO is 5.0 mg/L in fresh water that is at 25°C, for example, then it is 60% saturated (5.0 divided by the saturation level of 8.3 mg/L, multiplied by 100%). This saturation concentration is known as the solubility of O2, which is the amount of O2 that water can hold. The solubility of O2 changes with temperature, salinity and pressure. The solubility of O2 in water increases as the temperature decreases, meaning that cold water can hold more O2. For example, cold water at 5°C (12.8 mg/L) holds about 55% more dissolved oxygen than warm water at 25°C (8.3 mg/L). Because the temperature of water varies with the seasons, DO levels tend to be higher in the cooler months because the solubility of O2 is higher in cold water. In the summer, water levels tend to be lower and the air is warmer, which leads to warmer water and lower DO levels. The salinity of water also affects the solubility of O2, such that seawater can hold about 20% less O2 than fresh water. Dissolved oxygen solubility changes with temperature and salinity. Pressure also affects the solubility of O2. The water pressure at a certain depth depends on the height of the water column above it, so pressure increases with depth. Water at greater pressure can hold more O2, meaning that the solubility of O2 increases at greater depths. For example, water at 4 m (13.1 ft) depth can hold about 40% more O2 than water at the surface. It is possible for water to have a DO level that is higher than the solubility of O2 (more than 100% saturation). This condition is called supersaturation, which can happen under special circumstances (see below). The main source of O2 in water is the atmosphere. Oxygen molecules slowly enter water at the water surface. This process is aided naturally by turbulent flowing water, wind, and waves. Because of this, still water tends to have lower DO values than rapidly moving water. Aeration of water naturally by rapids or waterfalls, or artificially by bubbling air through water, turning waterwheels, or spilling through dams, greatly accelerates the transfer of O2 from air to water. O2 also enters water bodies from tributary streams and groundwater discharge. O2 in water is also produced through photosynthesis, in which plants and algae convert dissolved carbon dioxide (CO2) into organic matter, releasing O2 into the water. Photosynthesis only takes place at times of day where light is present. The depth at which photosynthesis takes place depends on the clarity of the water. In murky water, light may not reach the bottom of a deep lake. Aquatic plants, animals and microbes consume O2 by respiration, where organic material used as fuel is converted back into CO2; this is the opposite of photosynthesis. Many people are surprised to learn that plants consume O2 as well as produce it. Plants will actually consume O2 by respiration at night and release O2 through photosynthesis during the day. Because of this, DO in some aquatic environments will tend to decrease at night and increase in the daytime. Microbes and fungi also consume O2 through the decomposition of dead organic matter. Often, this happens in deeper layers of the water column as dead material sinks toward the bottom. Because of this, deeper layers of water often have lower levels of DO than shallow layers. Different species of aquatic animals have different DO requirements. Animals that feed on the bottom of a water body, where DO levels tend to be lower, can typically tolerate lower DO levels that animals that dwell near the surface. Most fish are able to survive and grow at DO concentrations of 5 mg/L or higher, although spawning and optimal growth may require higher concentrations. When DO levels are too low for a certain species, the animal can become lethargic or die. Hypoxia is a condition where DO is low enough to threaten aquatic animal species. Hypoxia can cause dead zones in water bodies, where fish and other aquatic life are absent. A DO level of less than 1-2 mg/L is generally considered hypoxic, and a level less than 3 mg/L is a cause for concern. These values are below the requirements for spawning and growth of most fish. At the opposite extreme, supersaturation of water with O2 can lead to health problems in fish. Supersaturation arises when the solubility of O2 in water rapidly decreases or when O2 is rapidly produced by photosynthesis. The solubility of O2 can decrease when water temperature rises, for example, so a rapid rise in water temperature can lead to supersaturation. Supersaturation with O2 can cause a health condition in fish called gas bubble disease. Because dissolved O2 is needed by most aquatic organisms, the DO of a water body is often used to assess its health. DO levels in water bodies can be impacted by a number of different environmental problems. For example, runoff associated with clearcutting or agricultural wastes can carry excessive organic material into water bodies, which can result in the depletion of O2 as the material is decomposed. Another problem is excessive nutrients, which can enter water bodies through runoff associated with fertilizer application on agricultural or recreation land (such as golf courses) or from wastewater treatment plants. Excessive nutrients can result in algal blooms, a process known as eutrophication. Algal blooms can block light from reaching aquatic plants, and dead algae provide a source of organic matter that can deplete DO levels when it decomposes. Because the dead algae sink, this problem especially impacts deeper layers of water and animals that dwell on the floor or bed of the water body. Riparian vegetation (plants that live along the banks of a stream or river) protects the DO of streams by providing shade that helps keep the water cool. When this vegetation is removed, however, the temperature of the water can increase, causing a corresponding drop in DO levels. The temperature of water can also be affected by other human activities. When water is withdrawn or stored for drinking water, irrigation, or industrial use, especially during dry months, the water level in streams can decrease, making them especially susceptible to temperature fluctuations and warming. The resulting decrease in DO can harm aquatic life in these water bodies. When water is used for industrial cooling processes and then discharged back into a stream, its temperature is often higher than the water in the stream, resulting in warming of the stream and a decrease in its DO. Dissolved oxygen is affected by many different factors and processes found in water bodies, and it can fluctuate over short time scales. Fortunately, most aquatic life can tolerate short periods where DO is low. However, persistent problems with low DO levels can lead to poor health of an aquatic environment. This is why routine monitoring of DO is important when there is concern about the health of aquatic life. FAO. (2014). Site selection for aquaculture: Chemical features of water. Washington, DC: Fisheries and Aquaculture Department, www.fao.org. U.S. Environmental Protection Agency (1986) Ambient water quality criteria for dissolved oxygen. EPA 440/5-86-003. With an appropriate instrument, electrical conductivity (EC) measurements are relatively fast and simple. EC measures the ability of water to conduct an electric current, which in turn depends on the concentrations of ions in the solution. Because of this, EC provides useful information about the solution and can be used to estimate its total dissolved solids (TDS). The conductivity of water is measured using a probe that is inserted into the water. Using the electrodes in the probe and the electronics in the instrument, the instrument is able to measure the conductivity and report a temperature-compensated conductivity value (units of µS/cm are most typical). To ensure an accurate result, the instrument is usually calibrated with one of more standards prior to the measurement. To make accurate measurements, a conductivity instrument is usually calibrated using potassium chloride (KCl) solutions of known concentration. Typically, a standard composed of 0.01 M KCl is used, which has a conductivity of 1412 µS/cm at 25°C , but a standard that has a conductivity similar to the solutions being analyzed is ideal. For greater accuracy over a wide range of conductivity values, up to 3-5 standards of different KCl concentrations can be used to calibrate the instrument. There are three main factors that affect the conductivity of a solution: the concentrations of ions, the type of ions, and the temperature of the solution. 1) The concentration of dissolved ions. An electrolyte consists of dissolved ions (such as Na+ and Cl-) that carry electrical charges and can move through water. As each ion is able to carry an electrical charge, water with more ions present is able to conduct a greater amount of current. This is the most important of the three main factors. 2) The types of ions in solution. Different ions have different abilities to transmit charge. Inorganic ions such as Na+, K+, Mg+2, Ca+2, HCO 3-, Cl- and SO4-2, tend to conduct electricity well, although each ion has a different ability to conduct electricity. This depends on factors such as the charge of the ion, its size, and its tendency to interact with water molecules. Heavier ions tend to move slower, but small ions can often attract water molecules more strongly, resulting in a slow-moving hydrated ion. For example, the lightweight ion Li + actually moves electricity only about half as well as the heavier K+ ion because of its stronger interaction with water molecules. Organic substances tend to make poorer electrolytes than inorganic substances largely because they have a relatively weak tendency to dissociate into ions. For example, acetic acid is a weak acid with a tendency to stay in its uncharged CH 3COOH0 form rather than separate into the hydrogen (H +) and acetate (CH3COO-) ions. Because many organic substances are weak acids, the conductivities of solutions containing them will tend to rise as pH increases. This is because organic acids tend to become converted to their ionic forms as the solution becomes more basic. 3) Temperature. This is a relatively small, but significant, effect. Because ions can move faster in warmer water, the conductivity of water increases with rising temperature. Conductivity will increase by approximately 1.9% for each 1°C increase in temperature  (or a little more than 1% for each 1°F difference), which makes it necessary to compensate for temperature so that different conductivity measurements can be compared. To make it easier to compare results for samples tested at different temperatures, conductivity measurements are usually reported as temperature-compensated values. This means that the value reported is what the conductivity would be if the temperature was 25°C. For example, the actual conductivity of a solution tested at 20°C will be lower than the reported temperature-compensated value. Temperature compensation is usually done automatically with a built-in thermistor in the conductivity probe. If the conductivity readings are not temperature compensated, especially when the temperature is far away from 25˚C, the results would not be dependable. Can conductivity be determined without using a conductivity instrument? As described above, the conductivity of water depends on the type and amounts of charged ions in solution. If the chemical composition of a solution is known, and if the ions present are limited to well-characterized inorganic ions such as Na +, K+, Mg+2, Ca+2, HCO3-, Cl - and SO4-2 or some organic ions, the conductivity of the solution can be calculated based on the conductance properties of each ion. This is most easily accomplished using specialized chemical software such as PHREEQC . However, it is usually simpler and more direct to measure the conductivity with an instrument. Haynes, W. M. (2009). CRC handbook of chemistry and physics: a ready-reference book of chemical and physical data. Boca Raton: CRC Press. Parkhurst, D.L., and Appelo, C.A.J. (2013), Description of input and examples for PHREEQC version 3--A computer program for speciation, batch- reaction, one-dimensional transport, and inverse geochemical calculations: U.S. Geological Survey Techniques and Methods, book 6, chap. A43, 497 p.